But seriously folks. There are some things people should know about fiddleheads before cooking them, and apparently some of them can cause GI illness if not prepared correctly, though generally speaking they’re safe and delicious. You just need to cook them thoroughly. And not eat them raw. As far as what they taste like, they’re not very far from asparagus or broccolini, with a super green freshness, slight nuttiness and hint of bitter aftertaste. By the way, this recipe is not my invention. I found it at Earthly Delights. But I scoured pages and pages of recipes to find ideas for the perfect simple treatment, and it wasn’t easy to find, so I wanted to make it easy for you. 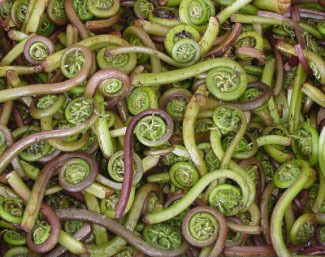 Clean and trim the fiddleheads, snipping off the tough stems or any brown unsightly parts. Rinse in cold water – you may need to go through a few rounds of cold water until it’s clear. Meanwhile, boil two quarts of salted water and have a bowl of ice water on hand. When the water is boiling, add the fiddleheads. Return to a boil and cook for only about two or three minutes, timing it carefully. Strain the boiling water and dunk the ferns immediately in ice water. Drain the fiddleheads and pat them dry. Meanwhile, in a large skillet over medium heat, melt the butter. As it begins to bubble, add the blanched fiddleheads. Sauté for about two minutes, then add the lemon juice and stir thoroughly. Season with salt and pepper and remove from heat. Serve immediately.